But his name appears almost as often in Bartlett’s Famous Quotations as it does in baseball’s record book. 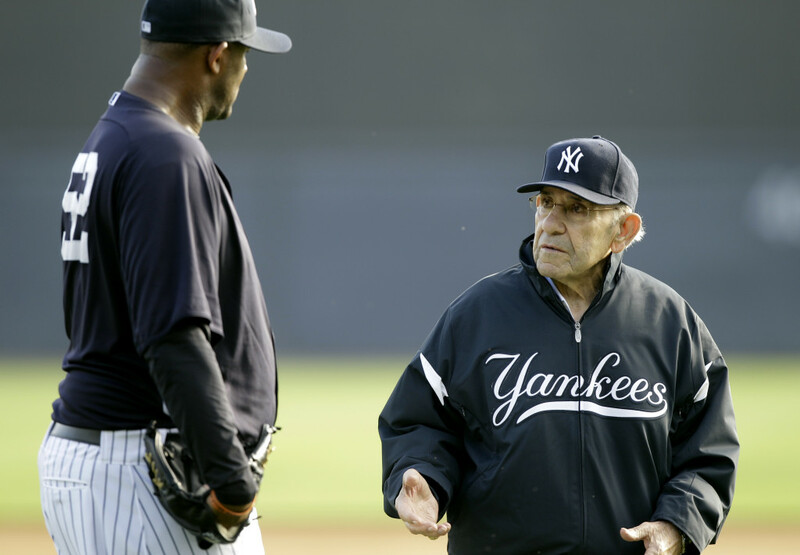 “It ain’t over ’til it’s over” is among eight “Yogi-isms” included in Bartlett’s. “When I’m sittin’ down to dinner with the family, stuff just pops out. And they’ll say, ‘Dad, you just said another one.’ And I don’t even know what the heck I said,” Berra insisted. 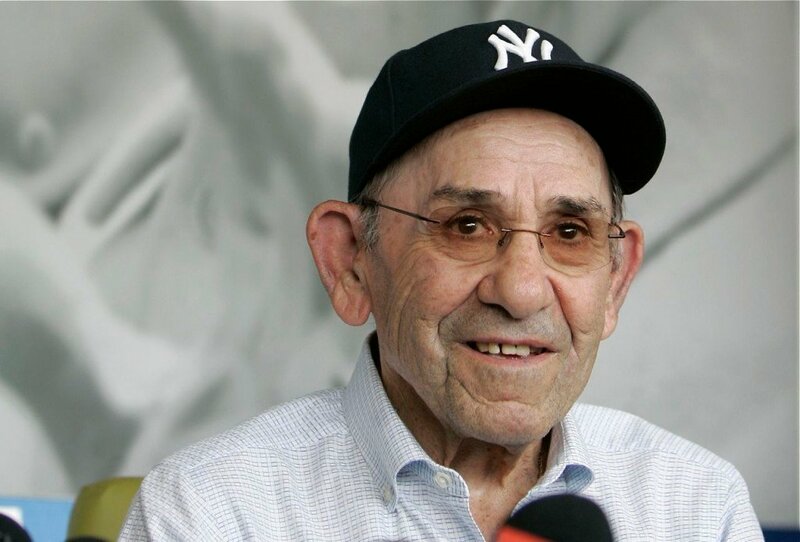 Berra played for the Yankees from 1949-65. 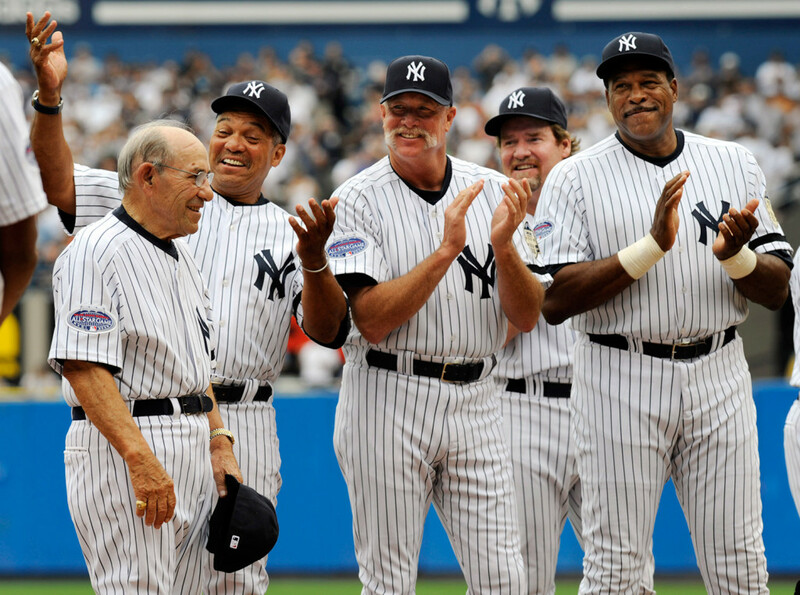 His teammates included fellow Hall of Famers Joe DiMaggio, Mickey Mantle and Whitey Ford. 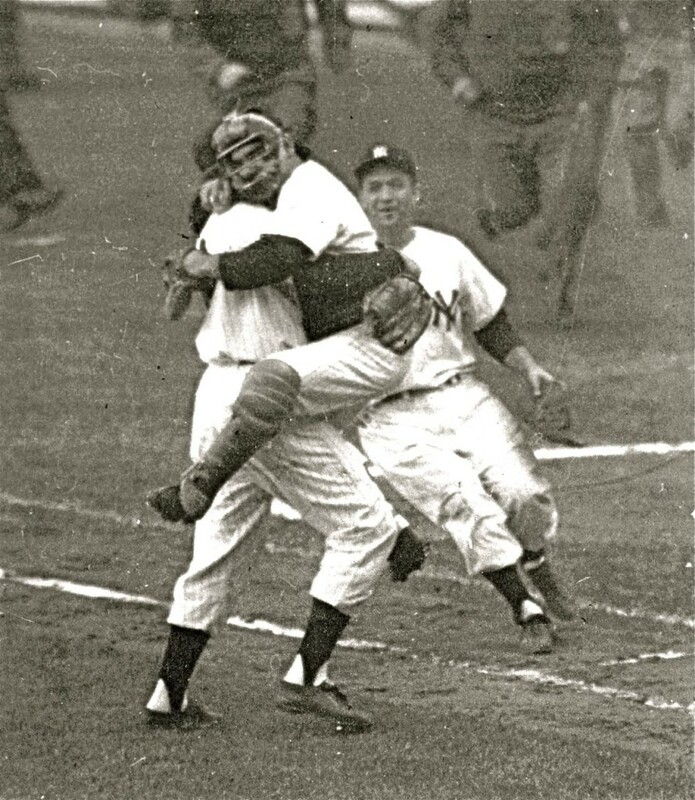 In 1956, he caught the only perfect game in World Series history and after the last out leaped into pitcher Don Larsen’s arms. The famous moment was captured in photographs published in newspapers around the world. After his playing days, Berra coached or managed the Yankees, New York Mets and Houston Astros. 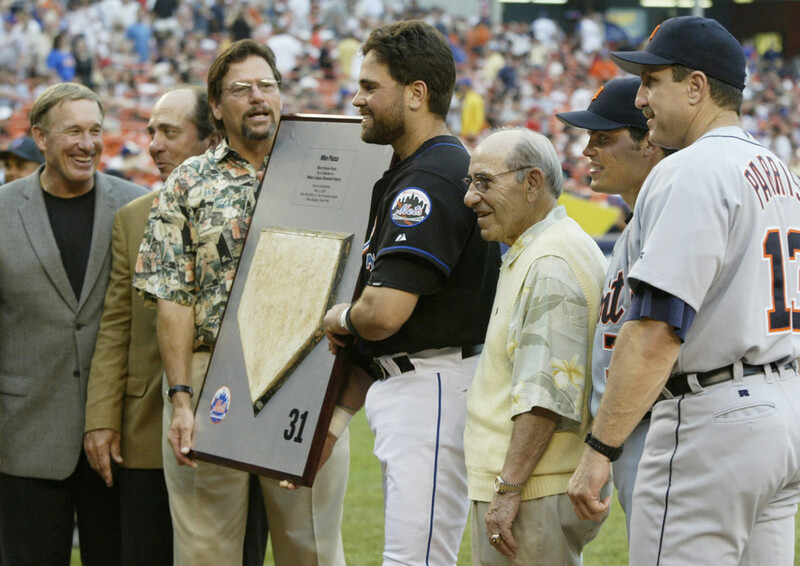 He led both the Yankees and Mets to pennants. 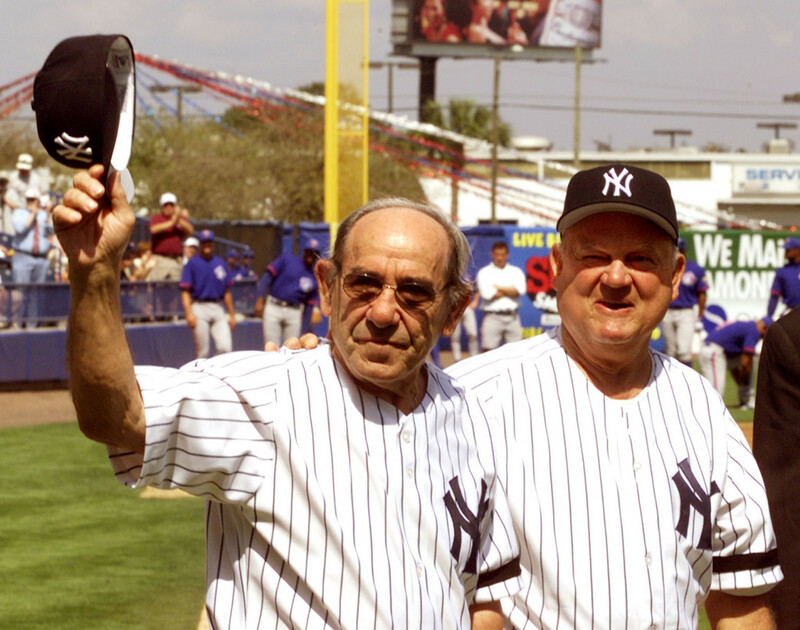 In 1985, his firing as manager by the Yankees 16 games into the season sparked a feud with George Steinbrenner. 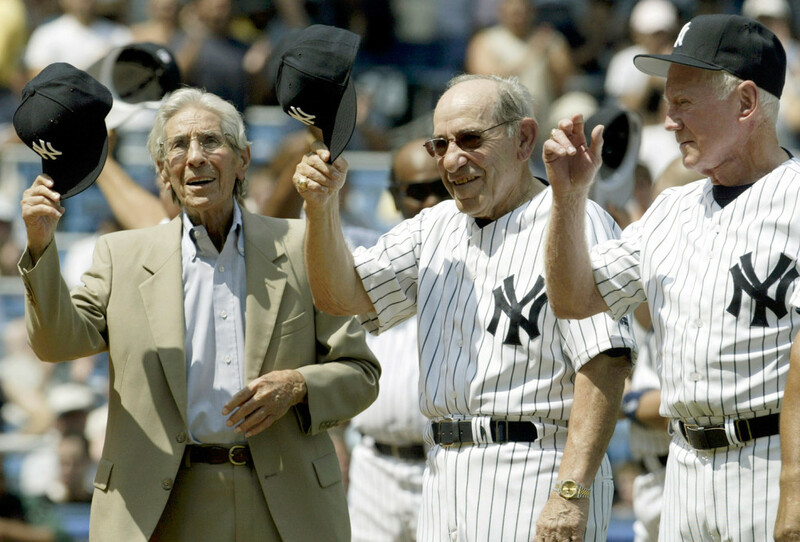 Berra vowed never to return to Yankee Stadium as long was Steinbrenner owned the team. 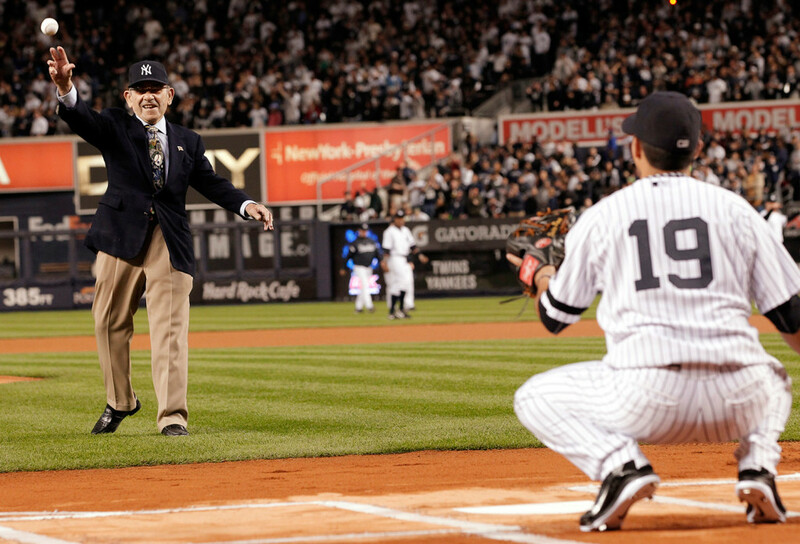 But in 1999, Berra finally relented, throwing out the ceremonial first pitch of the Yankees’ season-opening game. 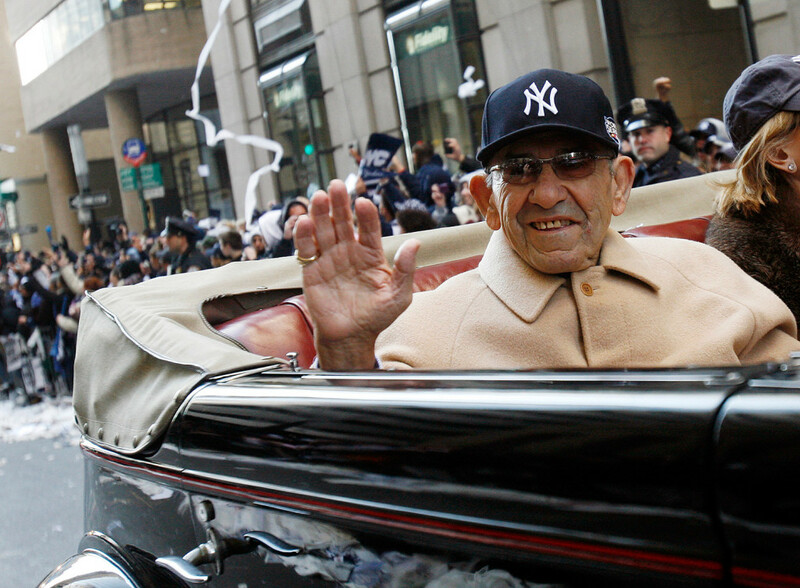 Berra, the son of Italian immigrants, got his nickname while growing up in St. Louis. Among his amateur baseball teammates was Jack McGuire, another future big leaguer. “Some of us went to a movie with a yogi in it and afterwards Jack began calling me Yogi. 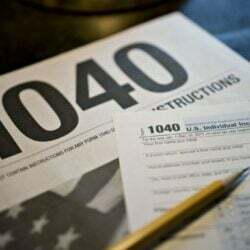 It stuck,” Berra told the Saturday Evening Post. 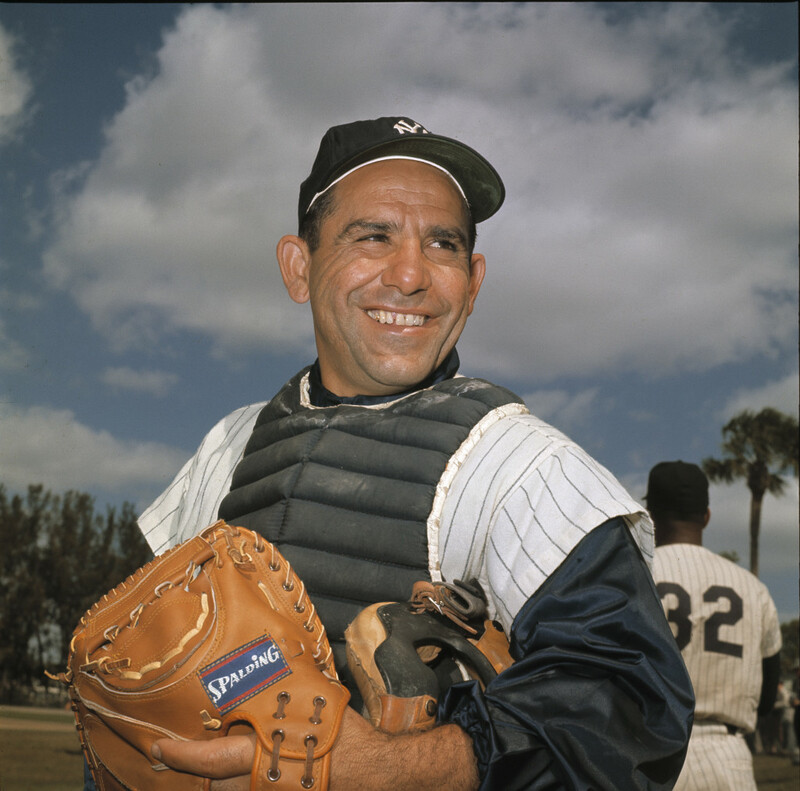 Berra, who played in 15 straight All-Star Games, never earned more than $65,000 a season. Growing up, he was anything but a natural. Chunky and slow, Berra was rejected by his hometown St. Louis Cardinals after a tryout in 1943. But a Yankee scout recognized his potential and signed him. He reached the majors late in the 1946 season and homered in his first at-bat. The next year, he continued to hit well, but his throwing was so erratic he was shifted to the outfield, then benched. His breakthrough season came in 1948, when he hit .315 with 14 homers and 98 RBIs while continuing to improve his fielding. In 1949, he compiled a .989 fielding percentage and did not make an error in the All-Star Game or World Series. Berra was AL MVP in 1951, 1954 and 1955. He holds World Series records for most hits (71) and most games (75). He was inducted into the Hall of Fame in 1972. Among his boyhood friends was Joe Garagiola, who went on to a career as a major league player and broadcaster. In rejecting Berra at the 1943 tryout, the Cardinals signed Garagiola, another catcher, instead. Lawrence Peter Berra was born in St. Louis on May 12, 1925, the son of Pietro, a laborer in a brickyard, and Pauline Berra. 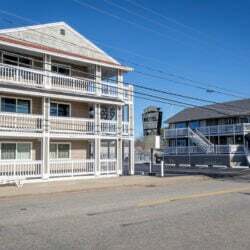 He grew up in “The Hill,” or Italian district, with three older brothers and a younger sister. Berra was forced to drop out of school in the eighth grade and go to work to help support his family. He took jobs in a coal yard, as a truck driver and in a shoe factory. He continued to play amateur baseball, which brought him to the attention of major league scouts. In 1943, his first professional season with the Yankees’ farm team in Norfolk, Va., was interrupted by World War II. He joined the Navy and later served on a gunboat supporting the D-Day invasion. Berra married his wife, Carmen, in 1949. The couple, who met in their native St. Louis, had three sons, including Dale Berra, who played in the major leagues as an infielder. 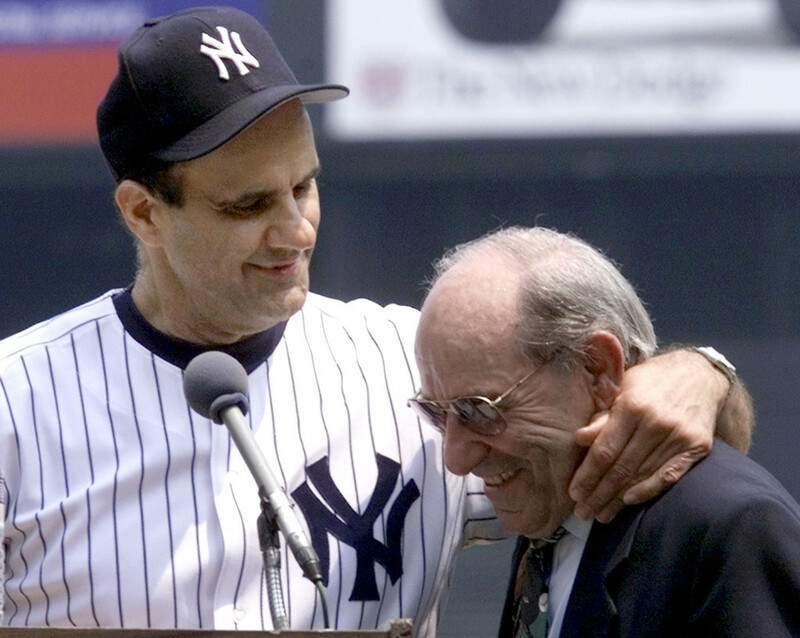 Berra published three books: his autobiography in 1961, “It Ain’t Over …” in 1989 and “The Yogi Book: I Really Didn’t Say Everything I Said” in 1998. The last made The New York Times’ best seller list. 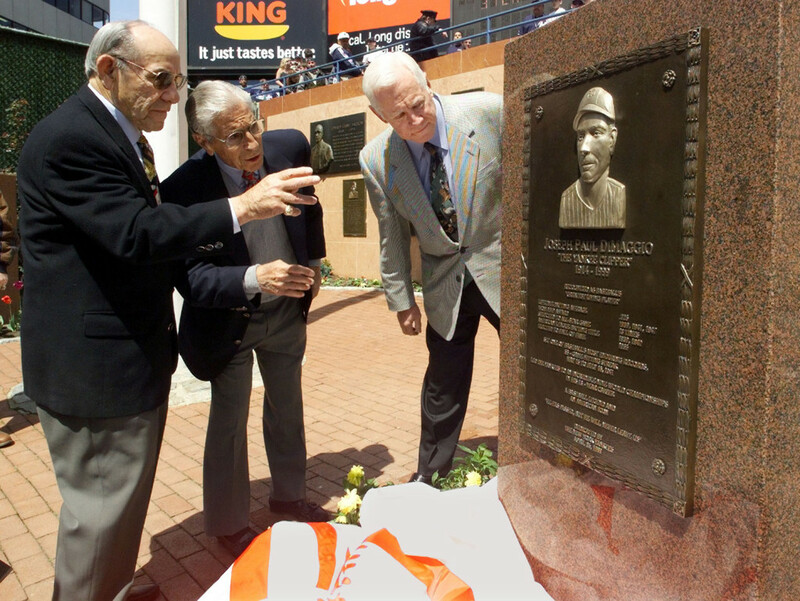 In 1996, Berra was awarded an honorary doctorate from the state university in Montclair, N.J., where he and his family lived. 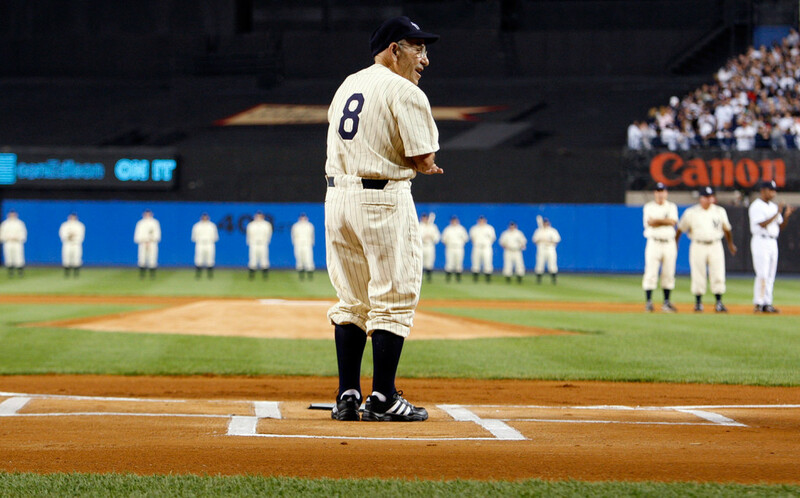 The university also named its baseball stadium for Berra. 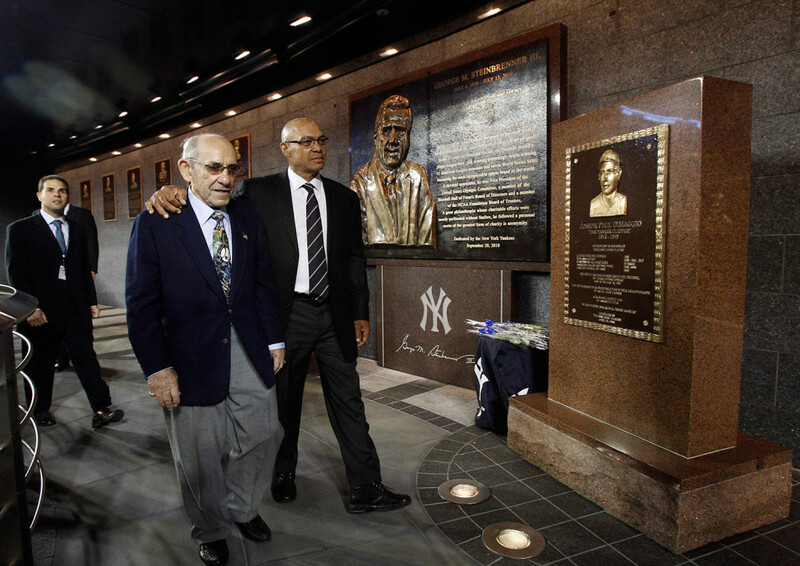 The adjoining Yogi Berra Museum opened in 1998. The museum houses Berra memorabilia, including what he said was his most prized possession, the mitt he used to catch Larsen’s perfect game. His wife once asked Berra where he wanted to be buried, in St. Louis, New York or Montclair.